Black, red, and white or yellowish rings circle the body. The red bands are much wider than the black and white bands. Some black bands may widen and cross over the red bands on the back. Occasionally there will be little red visible, especially in the central high Sierras near Yosemite National Park. Black and white snakes are sometimes found. A red band surrounded by two black bands is referred to as a "triad." Typically, fewer than 60 percent of the triads have complete red bands with no black crossovers. On this subspecies there are 19 - 48 triads, with an average of 35. The bands continue across the belly, but the coloring is paler, more faded in appearance, and the bands are more irregular, often encroaching into adjacent bands. The nose is black. The rear edge of the first white band on the head is located behind the corner of the mouth. 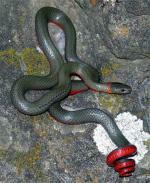 This subspecies, Lampropeltis zonata multicincta - Sierra Mountain Kingsnake, occurs from Ventura County north of Lockwood Valley north through the Tehachapi Mountains and the Sierra Nevada Mountains to Tehama County, where a very large intergrade range with the Saint Helena Mountain Kingsnake - L. z. zonata begins. The area from Ventura County to Tulare County may also be an intergrade range with the Coast Mountain Kingsnake - L. z. multifasciata. It is reported but unconfirmed from eastern slopes of the Sierra Nevada Mountains, from the White Mountains, and from Lassen County. A habitat generalist, found in diverse habitats including coniferous forest, oak-pine woodlands, riparian woodland, chaparral, and manzanita. Wooded areas near a stream with rock outcrops, talus or rotting logs that are exposed to the sun are good places to find this snake. From 1,500 - 8,000 ft. ( 457 - 2,440 m). Most common from 3,000 - 4,500 ft. (914 - 1,372 m).